April 21st is National Tea Day and to celebrate Gracie hosted a Disney Princess royal tea party. 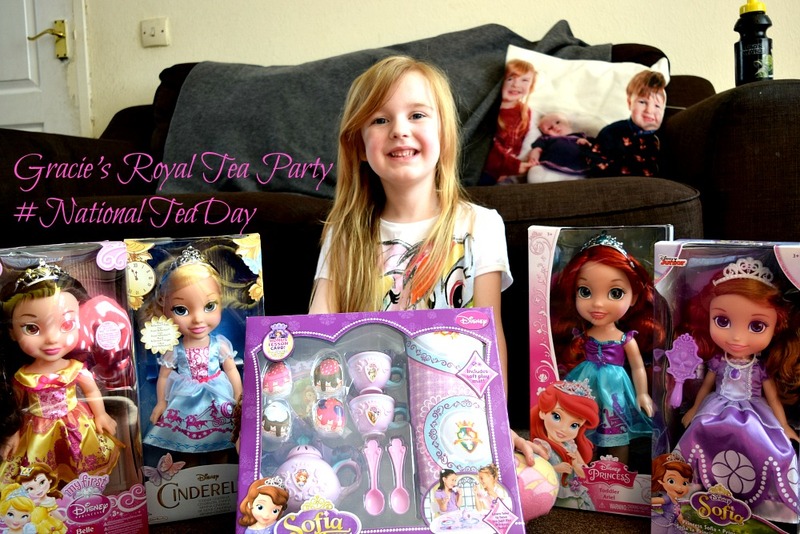 Using a Sofia the First tea set and a selection of Disney Princess toddler dolls, and of course wearing a crown fit for a princess herself, she had a lovely girly tea party. The toddler dolls are absolutely beautiful with lovely big eyes. Gracie was sent Belle, Cinderella, Ariel and Sofia and was so pleased with them. Their bendable arms and legs meant they could sit around the picnic blanket perfectly so she could serve them tea and cakes nice and easily. The Sofia the first tea set contained an awesome picnic mat with a hidden sugar pot and little cutlery holder holes, teapot, two teacups, two spoons and some soft and squidgy toy cakes. It is great for encouraging imaginative play. I thought the best way to show you Gracie's tea party would be to video it so you can watch her video below to feel like you are actually attending her royal tea party. If you live in a tea loving household (I mean are there really any non tea loving British households? ), then make sure you dig out your child's dolls or invest in a beautiful Disney toddler doll and enjoy afternoon tea with the kids on Thursday 21st April. The dolls are available online and in all good toy retailers.